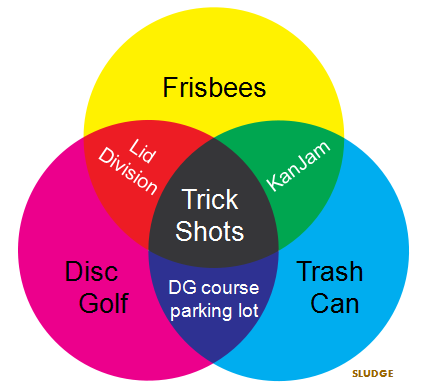 As demonstrated, Frisbee Trick Shots are more related to Disc Golf than to the sport of ultimate. 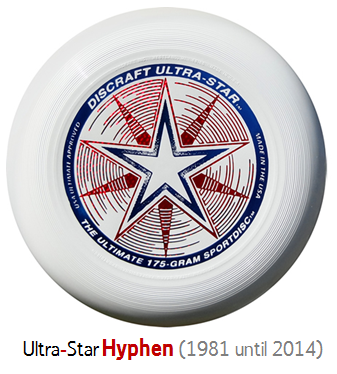 The Ultimate Disc Known as Ultra-Star Removes Hyphen From Its Name, according to Discraft. 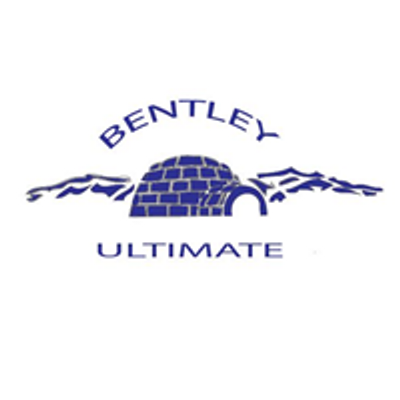 The renaming of the Hall of Fame Ultimate disc officially took effect in 2014. Gone is the punctuation mark that spent decades separating the words "Ultra" and "Star." This popular plastic flying sportdisc with the hyphenated name was born with a hyphen in 1981. "UltraStar" will take over for its former name. @sludgebrown Looks like a push, Sludge. As of 2014, officially UltraStar. Previous official has forever been Ultra-Star. Congrats to the USA Ultimate College Ultimate Champions! Each of these teams were the overall #1 seed entering their respective College Championships. 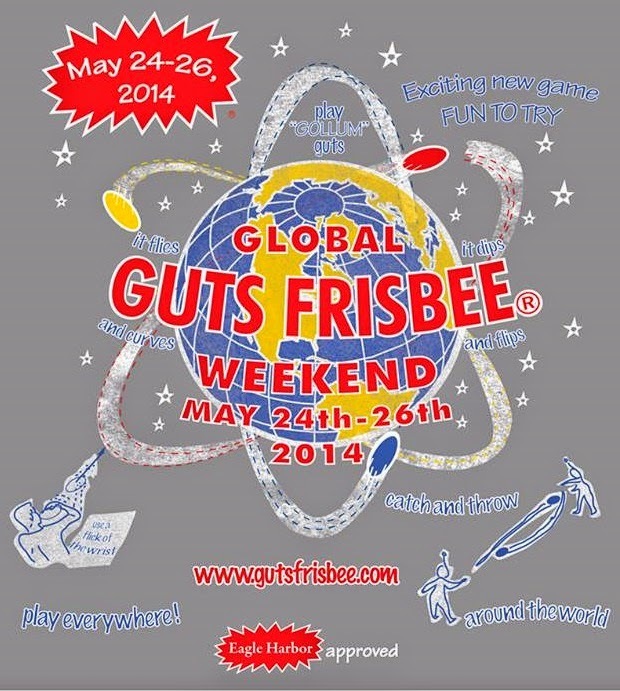 Apparently, this past weekend was more than just Memorial Day Weekend; it was also Global Guts Weekend! And you thought Ultimate had a name recognition problem! The purpose of Global Guts was to spread the Guts Frisbee sport to as many cultures and as many places across the globe as possible. Events were reportedly held in Michigan, Taiwan, Japan and Finland. 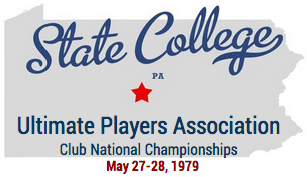 On this date - May 27 - in 1979, the first-ever National Club Ultimate Championships started play in State College, Pennsylvania. This was UPA's first championship event with the 5 regional champions from each region - West, Midwest, South, Northeast & Mid-Atlantic - competing for the first UPA title. Before 1979, the International Frisbee Association sponsored the National Championships won by Rutgers (1975-1976) and the Condors (1977-1978). In the finals on May 28, 1979, Glassboro (Mid-Atlantic) would win 18-17 over Santa Barbara Condors (West). TWO Ultimate Frisbee highlights were recognized on ESPN SC's Top 10 Plays. Sounds like Stuart Scott is president of the Ultimate Frisbee Fan Club! Set your DVRs for ESPNU on Wednesday, May 28! ESPN3's coverage of championship college ultimate games that had live-stream issues is scheduled to be re-broadcast. ESPNU, unlike ESPN3, categorizes the sport of Ultimate as "Frisbee." WatchESPN and ESPN3 are currently experiencing technical difficulties. Event reairs will be available once service is restored. 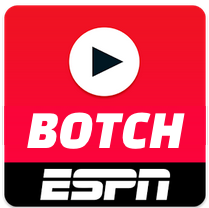 Last night's USA Ultimate's College Nationals semi-final "GAME" was scheduled to be live-streamed via ESPN3 (WatchESPN). But, the ESPN app/website/system was unavailable which prevented viewing of a primetime game of college Ultimate. Here's hoping ESPN fixes this in time for today's College Ultimate Championship games at 12p & 2:30p. ESPN3 continues to incorrectly categorize the sport of ultimate -- first as "poker," then as "entertainment," now as "games." While it's true ultimate is played in games (like most sports), every other ESPN3-listed sport has its own identifiable listing (e.g. basketball, football, soccer, tennis). The "GAMES" listing might be better off for board games or video games. 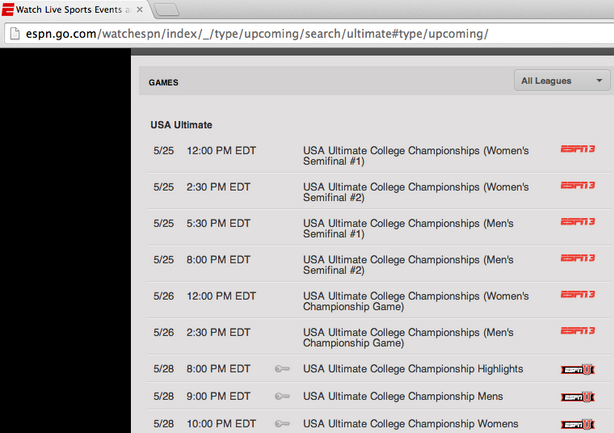 Until the sport is recognized by ESPN3, the USA Ultimate College Championships can be found listed under the Sport and Shows drop-down as "GAMES." 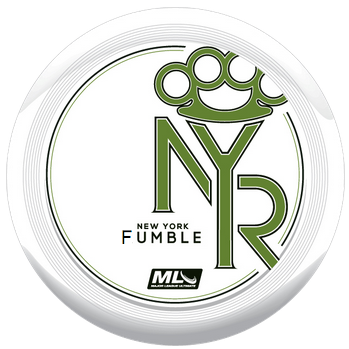 New York Rumble had 13 drops in their 23-6 loss to the Boston Whitecaps tonight. 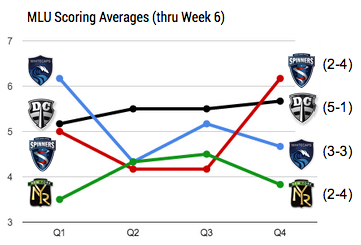 Dusty Rhodes, MLU Analyst for Major League Ultimate, published an article of scoring analysis by Eastern Conference teams through week 6 games (12 games). His conclusions are even more apparent with these supplemental visuals. The 2014 College National Championships start today! 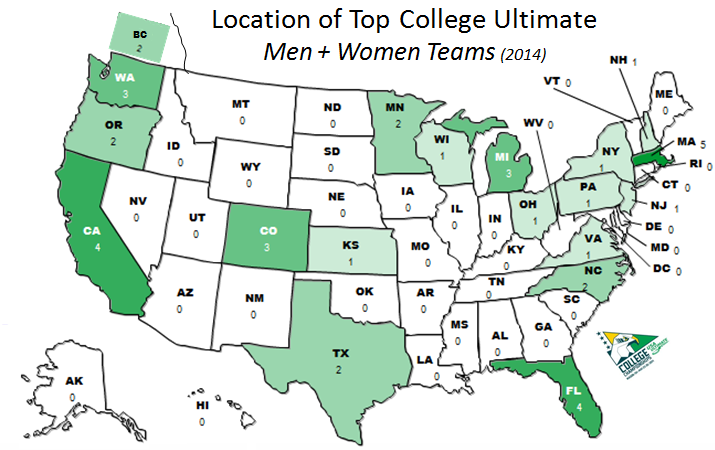 There are 20 teams from all over in each division - Men & Women - competing for the USA Ultimate College Championship. Men: Colorado, Pittsburgh, Texas & Oregon. 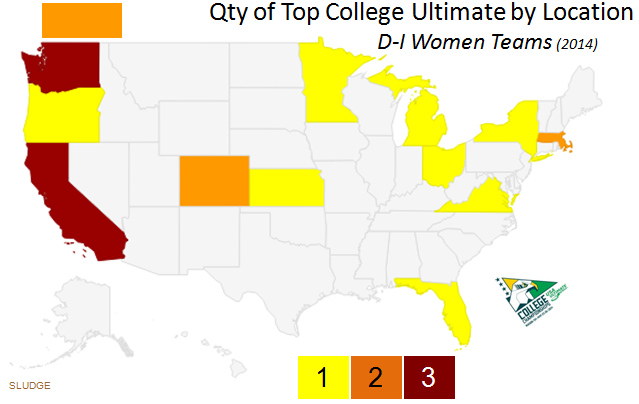 Women: Ohio State, Oregon, Central Florida, & Washington. ESPN3 will be covering semis and finals, plus NexGenNetwork will be live streaming pool play games. NGN sched & pricing ($15). 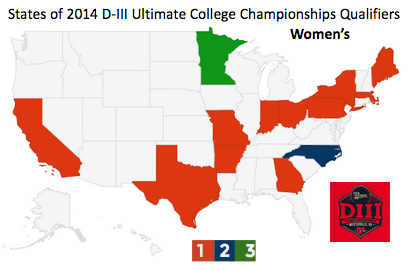 USA Ultimate's Division-I College Championships start this weekend in Mason, Ohio. College teams from 18 different states and 1 Canadian province will be represented at USAU 2014 College Nationals. The state of Massachusetts leads with representation of 5 college teams playing at this year's Nationals. West coast – British Columbia, Washington, Oregon + California – schools represent 9 teams (45%) at Nationals. Washington and California are states with highest representation with 3 schools each. WA: Washington, Western Washington & Whitman. CA: Stanford, UCSB & UCLA. Florida and Massachusetts are states with highest representation with 3 schools each. FL: Florida, Florida State & Central Florida. MA: Harvard, Tufts, & Massachusetts. American Ultimate Disc League has 17 teams which, at the start of the season, sold tickets ranging from under $5 to $16 per game. 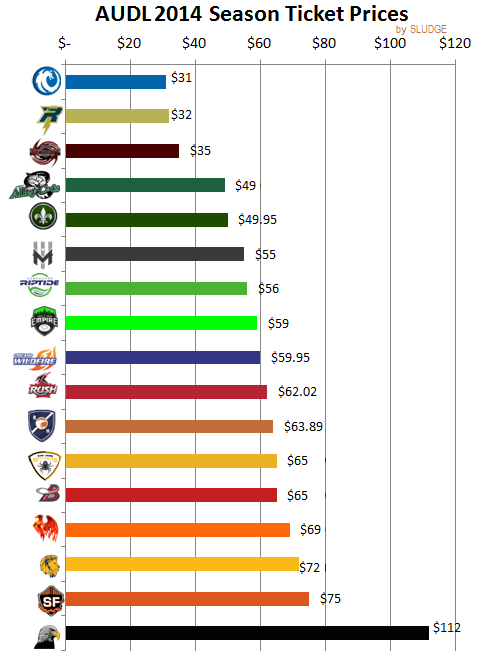 Rochester offers the least expensive tickets in the AUDL, while Seattle (who did not offer a season ticket option) calculates to be the most expensive over 7 games. NOTES: Prices for Canadian teams were converted into USD. Seattle is the only team to only sell tickets at the door (not offer a method to buy tickets online). Gender equity carries over to the Discraft advertising on USA Ultimate's website. Compare Discraft's "balanced" ad for USAU versus the one for AUDL's (men-only) pro Ultimate league. Discraft's face ad was originally seen in their 2014 catalog. Can we all agree this is not the best option as an alternative name for the sport of Ultimate? Flatball, or disc are still okay. 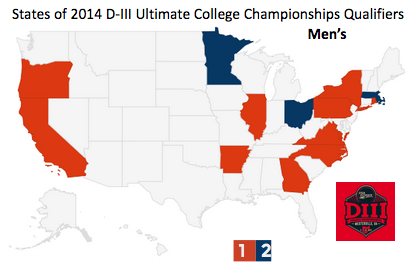 The USA Ultimate 2014 Division III College Championships takes place this weekend in Westerville, Ohio. Sixteen qualifying teams from each division will compete over May 17-18. Scandal - Washington DC's Elite Women's Ultimate team - has an updated logo. The new logo has a similar look and feel of the previous – retaining the cherry blossom, the lion, the monument, and, of course, DC's 3 stars & 2 bars. What's new is a more definitive shape with a two-color scheme and cleaner lines. Looking sharp! Just in time before the team starts defending their 2013 USA Ultimate title. 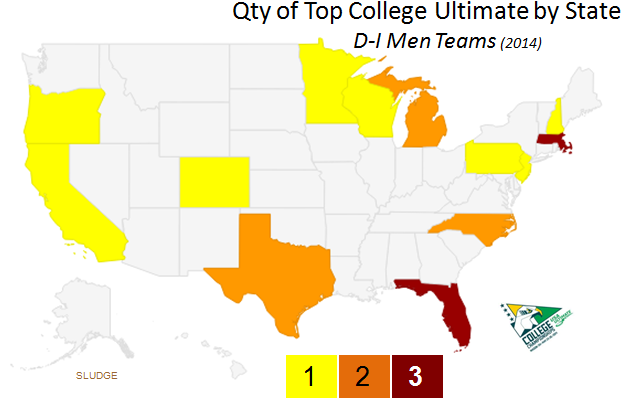 Looking at the cities with two pro Ultimate teams, who's got bragging rights? Albert Einstein - a supposed fan of Ultimate - already has an amazing memorial built in his honor. The bronze figure of Albert sitting down is actually situated blocks from Ultimate fields in Washington, D.C.
Now there's news another statue in the likeness of Einstein throwing a Frisbee on the Parkview campus of Western Michigan University. 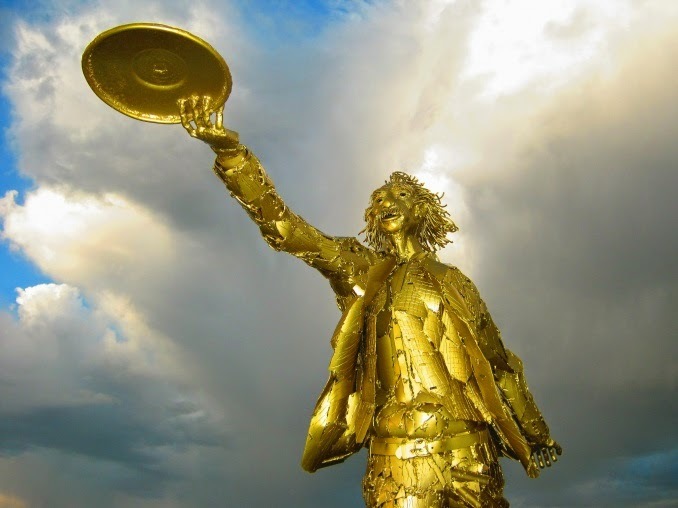 The realistic piece of art is a 1.2 times life-size sculpture of Albert Einstein and disc made of welded steel and powder-coated in gold. The sculpture was donated to and installed at the WMU campus this spring. On Saturday, May 10, the San Jose Spiders beat the Vancouver Riptide in a high scoring match, 39 - 3332. 72 71points is the highest combined point total ever in an American Ultimate Disc League game. 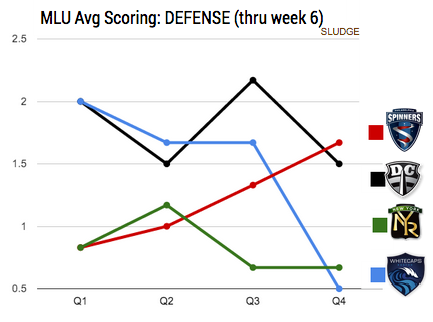 The AUDL plays four 12-minute quarters, which averages to 1 score every 40 ~41 seconds. 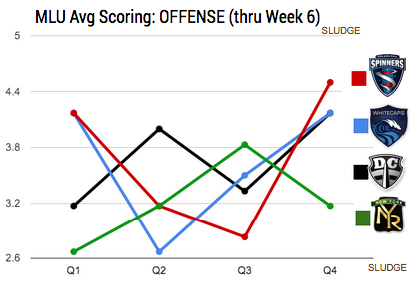 UPDATED SCORE based on Spiders & Riptide. Sorry for promoting BAD DATA. On this date (May 11th) in 1984, the very first Ultimate College Nationals began play in Medford, Massachusetts at Tufts University. The tournament had a few sponsors, including the Boston Hackey Sack & Frisbee Festival and Atari! In the inaugural finals on Sunday, Stanford won over Glassboro. RELATED: First intercollegiate Ultimate Frisbee game in 1972. A noon game on a Saturday is not an ideal time/day for a pro Ultimate game because 1) the target audience (ulti players) is probably playing ultimate, and 2) midday traffic in Chicago is a real bear. 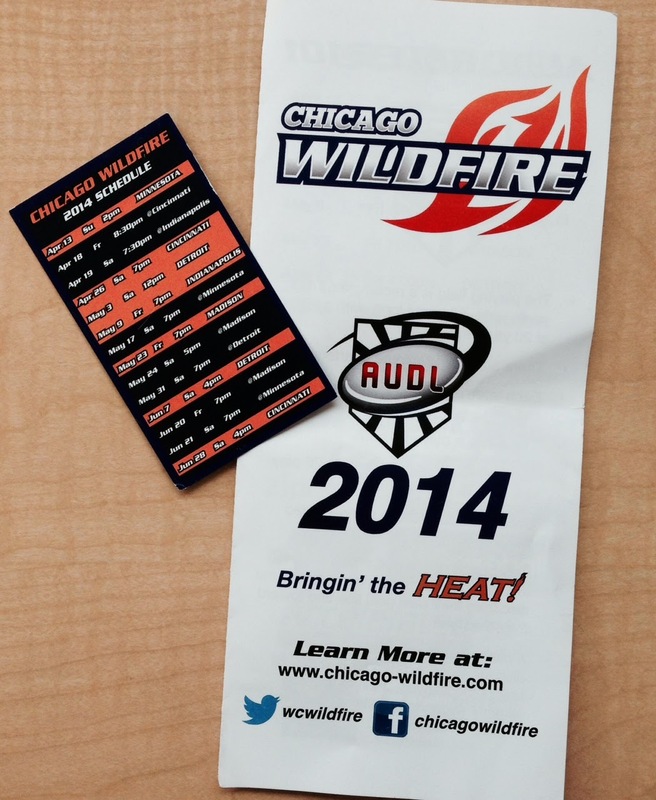 This 12pm game on May 3rd was the earliest starting time on the Chicago Wildfire's 2014 schedule, against a team - Detroit Mechanix - who just 15 hours before finished their first game of the weekend 300 miles away in Cincinnati, Ohio. After strolling through Roscoe Village, I eventually arrived to the campus of Lane Tech High School. The lack of signage along the busy Addison Street seemed like a missed opportunity to promote the pro Ultimate game - present and future. Furthermore, some signs could have helped me find the main entrance (it was in the alley in between the school and the stadium). I bought a $12 ticket and then grabbed a mini schedule and a tri-fold color Wildfire brochure/program. I followed the path around the north end of the stadium passing by sponsors' booths. Zipcar doled out some sweet (free) swag - wristband, sunglasses and a mini-disc. Generic stadium-food was also available for sale. Thankfully, the announcer over the speakers was my first clue that I was not crashing a pre-game scrimmage. The stadium was really empty. Lane Tech Stadium is a well-positioned venue against the backdrop of the high school's Gothic style red brick. Lane Tech's field was used for some parts of the classic 1986 movie, Wildcats, starring Goldie Hawn. 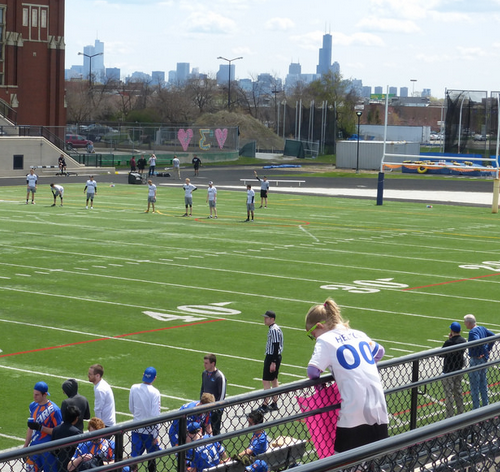 Finding seating on the west-side bleachers, you can get a gorgeous view capturing the field and downtown's skyline. Another cool sighting was the number of "Helton - 00" jerseys worn by youth fans. As a fan sitting watching a sporting event, the wind was welcomed in the warm sun. As a fan sitting watching ultimate, the wind was a nuisance impacting the flow of the game. There were a total of 66 turnovers in the entire game -- Chicago 30, Detroit 36. Additionally, Detroit had 17 drops while Chicago had 14; and, this seems low. Another low number was the attendance, which I generously estimated at 75. Detroit had a chance to be competitive in this game, but lacked discipline within the playing conditions. I'm no Tom Skilling, but would have described the weather as: windy with gusts. Kind of like playing at the beach where there's a consistent wind, but with moments of heavier gusts which ruin any floaty throws and make you second guess your abilities of throwing a plastic disc. The Mechanix could not catch the disc one-handed, nor should they have tried. Attempts of 15+ yard throws by the Mechanix were usually incomplete, yet they kept trying to throw them. Overall, the Mechanix had no set offense. The Wildfire were more patient and effectively utilized cross-field hammers to propel their offense. The game was hard to watch (and enjoy). 1. During one of the between-quarters, children younger than 8 years old were tossing discs into a lacrosse goal. They had decent form by keeping the disc low to the ground. When they scored into the net, it was exciting! 2. Detroit scored only 2 points in the 2nd half, so when they were close to the end zone, it was thrilling! 3. Goose's superman layout for the Wildfire's 15th point, it was super! Wildfire won 18-9. No, 16-9. Okay, 18-9! At the end of the bland match, a few Wildfire players greeted fans as they exited. The Wildfire store tent suffered from premature "dismantlation" less than 10 minutes after the game's end, so I didn't have time for an extensive look. Though, the store did have a wide variety of baseball hats. What I paid $12 for lacked "professional" game elements. Regardless of the day/time and attendance, I expected the Wildfire to offer more for the paying fans. More than the chance to watch an ultimate game in a stadium. I'd be remiss if it wasn't mentioned that Brodie Smith was on the sidelines for the Wildfire. There were a few questions for people in the stands about his presence. Q1. Will Brodie play today? A1. No, not in the game. Yes, throwing short tosses into the wind for almost-self-caught flight action on the sidelines. Yes, tossing during warm-ups while out of uniform. Q2. If Brodie is not playing, then is he scheduled to do trickshots during halftime? A2. No, he did not do any trickshots for the fans. Actually the only halftime "entertainment" was 4 guys playing Spikeball on the field, none of whom uttered the words "dark horse." Q3. Will Brodie suit up for the Wildfire today, or even this year? A3. Yes! 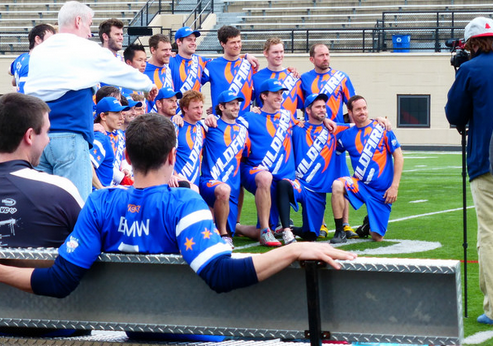 He actually donned the Wildfire jersey for a team picture at the end of Saturday's game. Kevin Durant, the 2014 NBA MVP, shows some freestyle ability to promote BBVA Compass bank. 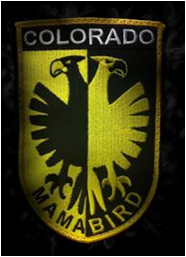 The away jerseys for MLU teams are not worn according to schedule. After sixteen games into the 2014 season, teams are not exactly adhering to the labels of "away" or "home" jerseys. 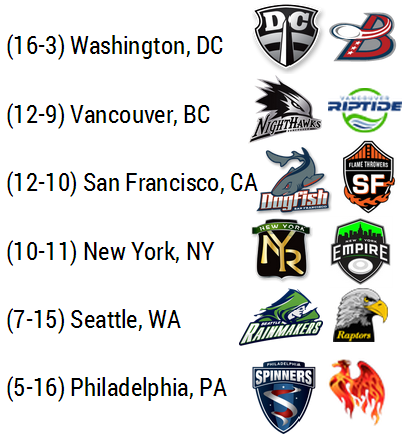 When Major League Ultimate unveiled their 2014 "away" jerseys in March 2014, seven out of the eight teams' jerseys were white; only Vancouver had a dark away jersey. With the exception of Vancouver, viewers might have expected seeing the away team wearing white. More often, visiting teams wear their home jerseys for their away games. 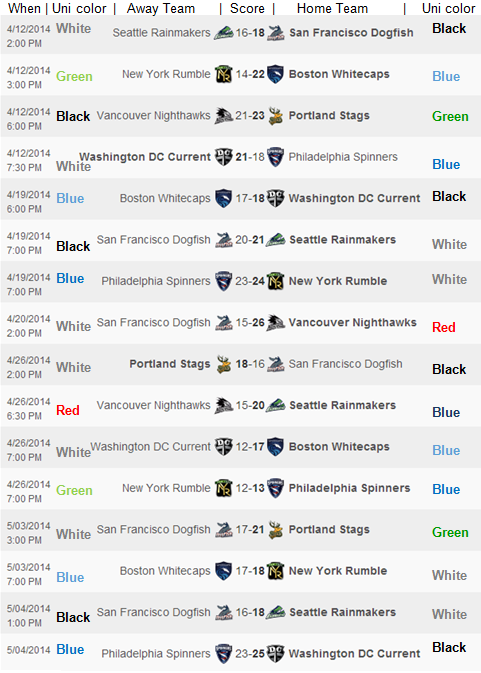 In only 44% of MLU games, the away teams have worn their designated "away" jerseys; (7 out 16 games). 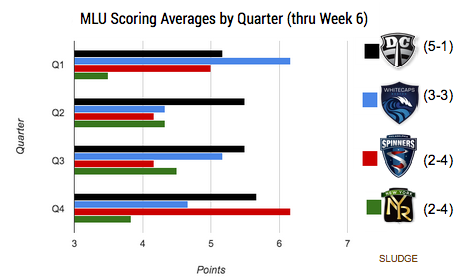 In 31% of MLU games*, both teams wore their designated "home" jerseys; (5 out of 16 games). Boston: In 4 games - 2 home, 2 away - the Whitecaps have worn their light blue (home) jerseys every game. Their white (away) jerseys have never been worn during a game yet. Philadelphia: In 4 games - 2 home, 2 away - the Spinners have worn their blue (home) jerseys every game. We have yet to see their white (away) jerseys during a game. New York: In their 4 games, Rumble has worn their green (home) jerseys in their 2 away games, and their white (away) jerseys in their home games; basically, opposite of what they're supposed to wear. San Francisco: They have played 6 games already. Their 4 away games have been back-to-back games over 2 weekends, during which they wore their black (home) jersey once during each road trip. Seattle: In their 3 home* games, Rainmakers have worn their white (away) jerseys twice. Vancouver: In their 2 away* games, the Nighthawks have worn their red (home) jersey once. 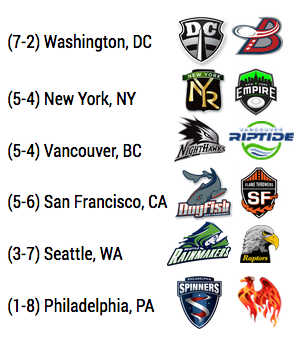 * = Week 3's (4/26) Vancouver vs. Seattle match was played at a neutral site in Washington state, but deemed a Seattle "home" game on the MLU schedule. Seeing this breakdown, it begs the questions: Who decides which uniform to wear? Why are teams not wearing their away jerseys?? @sludgebrown Think the kits are probably misnamed. Should be Team Kit and Alternate (or something similar). The Home Team has first pick. 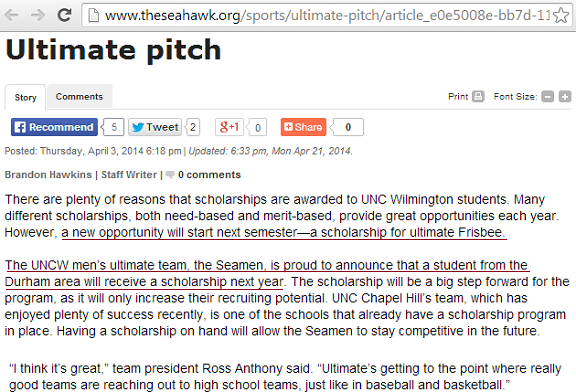 The UNCW Seamen recently won the 2014 Atlantic Coast Regional which in itself is a worthy recruitment tool. 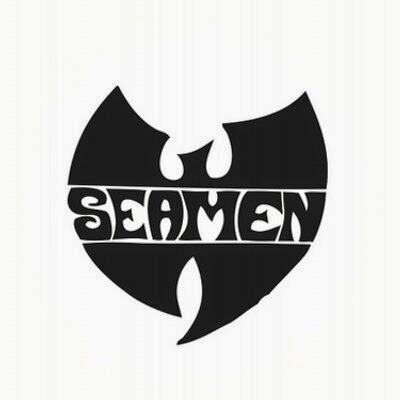 Now comes news the Seamen also offered a scholarship to a player in the sport of Ultimate. A. College. Scholarship. for. Ultimate! Frisbee!! The Seahawk article indicates UNC - Chapel Hill also offers a "scholarship" for their Ultimate team; UNC Darkside offers end-of-the-season monetary awards for their top freshman ($1000) and for the team's top returner ($500). The UNCW athletic scholarship, however, reads to be a form of financial aid for a student/player who committed to the UNCW Seaman Ultimate team. The University North Carolina-Wilmington newspaper story does not specify the scholarship amount, though the article notes the UNCW Ultimate team - considered a club sport - has plans to offer more in the future. There's also a possibility of the team becoming a non-profit. Currently, the team is crowdfunding their tip to Nationals. UPDATE: The UNCW scholarship = $2500. How many other colleges offer scholarships to students before the season to play on their college's Ultimate team? 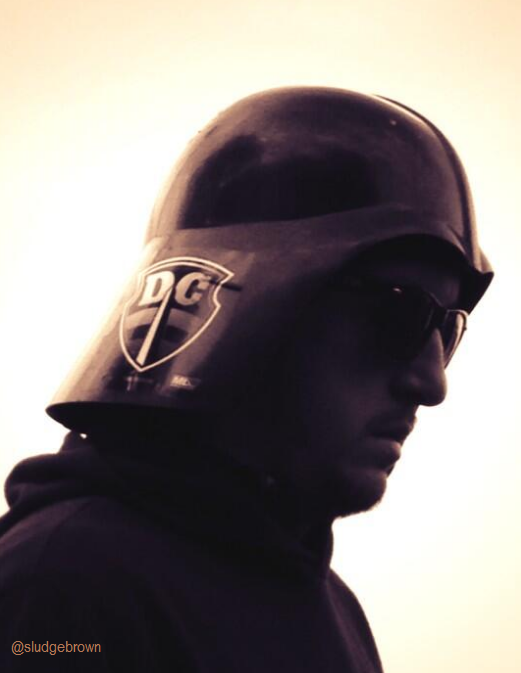 Darth Vader was spotted at yesterday's DC Current pro Ultimate game. This was a fortuitous sighting on a day that is celebrated as Star Wars Day (May the Fourth). UNCONFIRMED: The person may be Luke's father. Info: A white Innova Pulsar with 44 tiny black and silver stars surrounding the Current's alt logo in the center. The word "Ultimate" is added just below the alt logo. The top portion of the Washington monument points toward the center where there's also a Truck-Stop-y version of DC's primary logo. 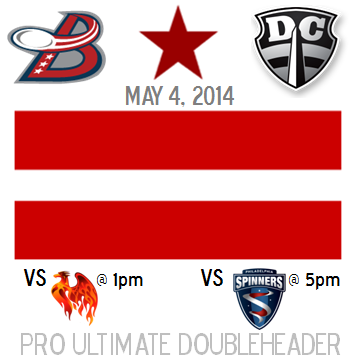 Today - Sunday, May 4th - presents a rare scheduling opportunity for local fans to cheer on both DC-based pro Ultimate teams as they go up against their respective league's opponent from Philadelphia. For those lucky to attend, be sure to grab the generously-priced tickets for the doubleheader. 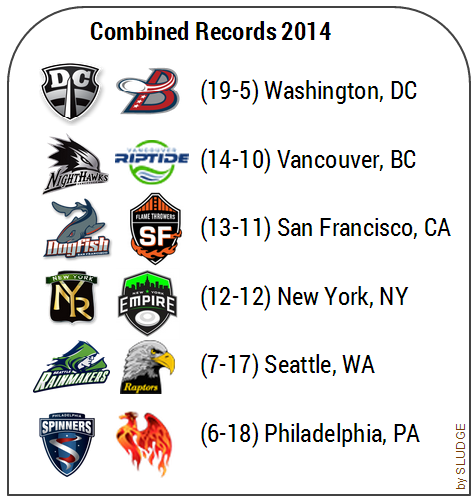 At 1pm, the AUDL game: D.C. Breeze (1-1) play Philadelphia Phoenix (0-1) in College Park. A few hours later (at 5pm) and ~6 miles away, the MLU game: D.C. Current (2-1) play Philadelphia Spinners (1-2) at Catholic U. In case you were wondering...a "doubleheader" occurred in 2013 on April 20 -- the inaugural day/night of pro Ultimate in Washington, D.C. Though, those 2 games were not played against teams from the same city. 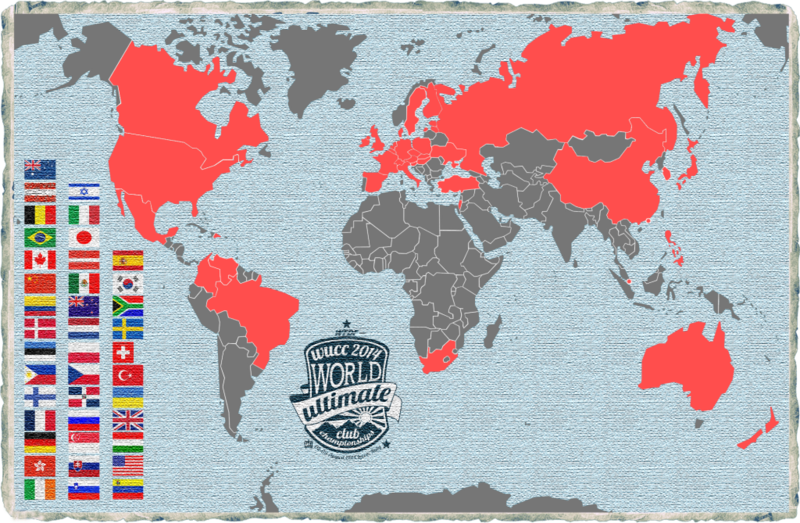 Three months away until World Clubs 2014 (August 2-9) when 161 Ultimate teams from 40 countries compete in Lecco, Italy.